For more than two months we have wondered east and west along the bank of the Ibar River. We have sat on the steps of the bank gazing north, watching for a glimpse of life on the other side, for some insight into the other half of our city. South Mitrovica: the stable side of the city, firmly a part of Kosov@. North Mitrovica: the side rife with conflict and nationalist extremism, caught between unity with Serbia and an independent Kosov@; the side until yesterday, which was constructed only of rumors and riverside views. Yesterday, we crossed the infamous Peace Bridge. For the first time, we continued straight, past the KFOR troops, past the mound of dirt and anger, and reached the other side. We were welcomed to north Mitrovica by a few awkward stares from overhearers of our whispered English, by strings of boycott banners, and by a message from our cell phone provider that we were unable to communicate with anyone in the north. With technology caught in the political divide, we had to rely on good ol’ social cues and observation to find our Serbian guide. Without her, the anxiety would have cut our visit very short and sent us running back to the other side. Since we arrived, everyone had told us not to go to the north at all. Acquaintances, co-workers, friends, expats, and diplomats all gave us the same unsolicited warning. They urged that if we did go, even though we shouldn’t under any circumstances, we should only go with a Serb. Though initially dismissive of these warnings, we did get a little scared over time. The longer something remains unknown, the longer you only hear rumors, the more intimidating and imaginative your view of that unknown entity may get. Our Serbian guide was disappointed by our fear and by the rumors we had heard about her hometown (her half of it, anyway). She insisted we would have no problems, no harassment, and no harm. How would it feel to hear all the negative things said about your home? As we walked up the main street after crossing the bridge, I was astounded by the vitality of this side of the town. Hip cafes so crowded they spilled onto the sidewalks. Couples and young students waltzing around the boulevard. Shops of all kinds with the latest fashions, handicrafts, local goods, and even gifts from the orient. Buildings were an equal balance of new and bright and depressingly dreary as on the south side. Debunking the rumor #1, that everything is old in the north because they do not get any money from Prishtina and not enough from Serbia. 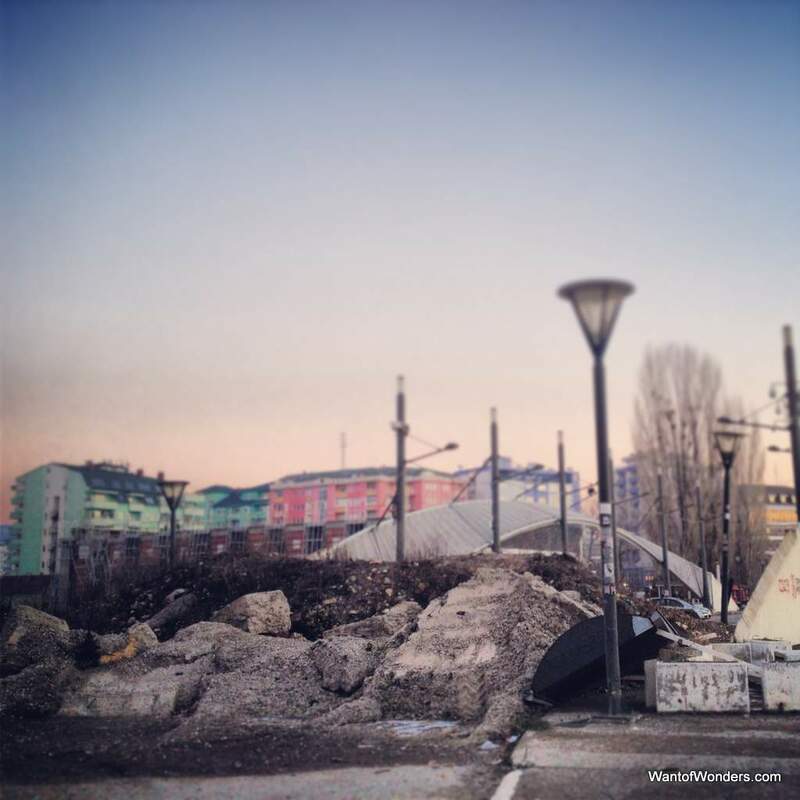 In many ways it felt like the same town, the same Mitrovica we had already become familiar with. But, other aspects made it feel like we had entered a different country. Cyrillic signs I could only partially decipher cluttered the storefronts. Prices labeled in dinar, lack of cell phone service, ETC all made us feel we had crossed a border. Some people want it to feel that way, others hate it. How can anyone live in the middle like that? How can you live your life with one foot in one country and one foot in another? Where do you put your head–which side? What about your heart? How long can you keep that up? Side streets wound away from the center towards the university, playgrounds, and endless cafes. Others wove up the hills towards the proud Orthodox Church and Yuogslav-era monument to Brotherhood and Unity, each perched on their own humps of a cluster of unusually triangular little hills. This was in no way the depressed or scary place that had been described to me by southerners. It was pleasant and filled with life. Cafes, bakeries, Serbian restaurants, new streets and a new language to explore. Our eyes were so wide while walking around. I am not sure if it was just the promise of something new after two months in such a small town or if it was genuine attraction to the other side, but I didn’t want to leave the elusive other.